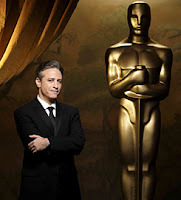 The Jack Sack™: BREAKING NEWS: Jon Stewart Is Overrated! BREAKING NEWS: Jon Stewart Is Overrated! Anyway, I won't bore you all with the usual comments about the winners, losers, dresses or musical numbers. Why, you ask? Because you're here at THE JACK SACK! We deal in blood, anger and sarcasm. So, with that being said, let me unleash upon you my manifesto of why Jon Stewart is overrated as a comic/entertainer/intellect. I don't know when the heck this took place, but at some point over the past several years, women of a undefineable demographic all went collectively insane and started to think that the mediocre comic talent that is Jon Stewart was some sort of genius. And I do point out women in this rant because it is you, you lovely, fascinating and otherwise brilliant creatures that brought this scourge of Jon Stewart upon our world. He is not a complete bum, I'll grant you that, but I can honestly say that the guy is not as smart, handsome and ideal a father to your children as you probably think. Jon Stewart squeezes a laugh out of you and you probably don't even know it. Think about it-- ever notice how he does the googley-eyes to the camera to ellicit laughter? Or how about when Stewart throws in a cutesy high-pitched voice to ressurect a joke after it bombs? And have you noticed how he resorts to self-deprecating remarks continuously throughout his routine? This is the comic equivalent of urinating on yourself so you don't get booed. Do you think Don Rickles would ever act like this? And so many of you fall for it! I'm waiting for Stewart to come out in a Hugo Chavez red shirt and declare his own nation-state in his studio one of these days. I wouldn't doubt a lot of you women would rush to be a willing subject in his court. Oh, don't roll your eyes at me-- you're thinking about it! And that brings me to last night's Oscars. Jon Stewart was the host of the ceremony and I have to admit he really sucked more than usual in my opinion. His joke about Dennis Hopper being on drugs was stale. His joke about Jack Nicholson possibly impregnating actresses during the show was also blunt and uninspired. And his political humor was amateurish, which is really a sign of his weakness last night because that is his usual bread-and-butter material. No, ladies and gentlemen, Jon Stewart sucked. See, my theory on Stewart's popularity (aside from his aforementioned mojo with the females) is that he followed in the footsteps of the most assinine personality imagineable: Craig Kilborn. Now, I appreciate this guy because he was an unapologetic frat-boy. He was a complete and total jerk and he went into realms of absurdity that were truly funny. Is Kilborn funnier than Stewart (independent of their respective writing staffs)? Probably not. But Kilborn never kissed your toes to make you laugh. No, he went up there and if he bombed, he took it like a man. Stewart, you are no man. Sweet Fancy Moses, you really hate Jon Stewart. I don't care. I love him. He can urinate on himself all he likes. AND-- Jon Stewart had the nerve to rip on Eddie Murphy- a true comic talent. Yes, Murphy has made some bad movies of late, but for Stewart to rip on Eddie Murphy is like Rachael Ray saying Julia Child sucked as a cook. Absurd!!! Rickey still misses Killborn on the Daily Show. Stewart's shtick seemed decent at first, but he's become increasingly bland over the years and goes for the cheap funny. Political humor just aint funny if it isn't edgy and provocative. Oh, and ILM was completely robbed for the special effects Oscar for Transformers. Kids Try To Be Like Bauer, Fail. Apocalyptic Picture of the Week! The Jack Sack Studies Language: The C-Word!